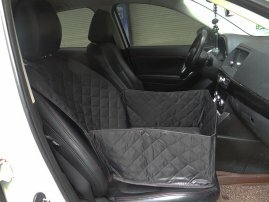 Anti-Skid, Durable Pet Front Seat Cover / Dog Booster Seat w/Side Flap for Cars, Vans, Trucks & SUVs [CAR005983] : Onchee.com - the accessory shop for all your handheld Electronics! This is made of heavy duty Oxford cloth, waterproof, non-slip, Non-Scratch, Silver ion antibacterial anti-virus no smell. It is perfect choice for Both Pets & Car: Available for most cars, trucks, and SUVs. Not only for small medium dogs, Perfect for large breeds. - Solid Material: High Quality Waterproof nylon fabric for durability. Effective protection car seat from pet hair, mud and water and scratches. - 2-in-1 Design: It can be used as Car Seat Cover or Pet Booster Seat as your choice. 4. Machine Washable: Use Gentle Cycle. Easy to clean it with a damp cloth or just vacuum. 5. Perfect Choice for Pets: Not only for small medium dogs, Perfect for large breeds. - Available for most cars, trucks, and SUVs. - Machine Washable: Use Gentle Cycle.